"An Old Story Newly Applied"
U.S. Representative Fernando Wood was a leader of the Peace Democrats (called "Copperheads" by their political opponents), who wanted a cease-fire and negotiated settlement with the Confederacy. 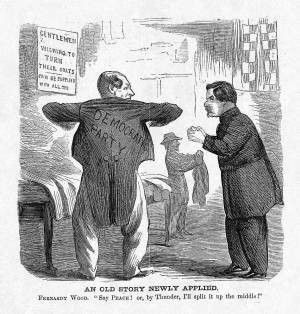 In this cartoon he threatens to split the Democratic party in two (like in 1860) if the likely Democratic presidential nominee, Union General George B. McClellan, does not endorse the proposed peace plank at the upcoming Democratic National Convention. With clasped hands, McClellan seems to be begging Wood not to make trouble. The sign in the left-background makes it clear that the cartoonist considers the Peace Democrats to be traitors (turncoats).